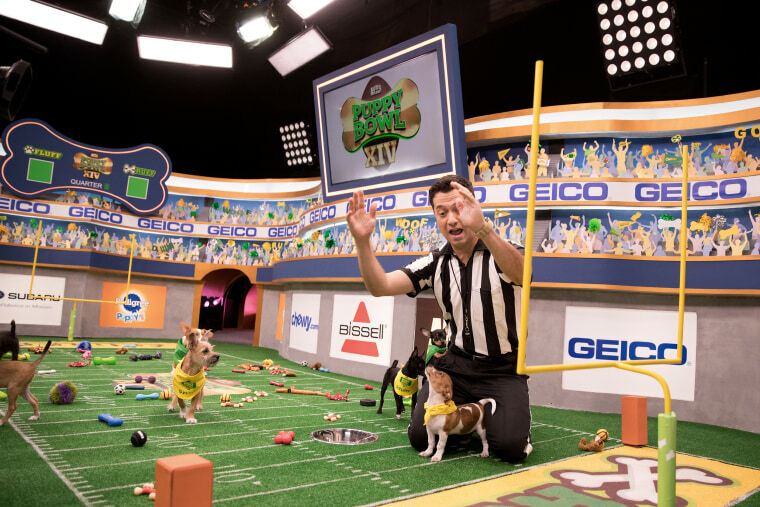 Dan Schachner: Refereeing the Puppy Bowl isn't just the best job. It's a chance to help so many dogs. Dan Schachner Refereeing the Puppy Bowl isn't just the best job. It's a chance to help so many dogs. Being part of the Animal Planet spectacular is as cute as it looks. But it also helps thousands of dogs find new homes. Being the referee for Animal Planet’s Puppy Bowl is really exciting and I couldn't be more grateful to have this opportunity. I’ve been doing this for seven years (which is 49 in dog years), and it is my dream job. They're going to have to pry it from my dead arms: The only way I'm going to give up this job is if I can pass it on to one of my kids. I have always loved dogs (as most of us do), and, prior to this job, I had worked for Animal Planet as a host for various pet technology specials — "Your Pet Wants This," and "Your Pet Wants This, Christmas Special"— these one hour, one-offs about awesome pet products, like a fetching machine that throws the ball by itself. When Puppy Bowl first began airing on Animal Planet in 2005, there was no ref, there was no nothing. Puppy Bowl I was a turf with lines across it, the end zones and a couple of puppies, that was it. Then, in 2011, the people behind the show decided to get a professional to replace the show producer, Andrew Schechter, who had stepped in as the first ongoing ref for Puppy Bowl IV in 2008, just to keep the chaos at bay (and because they thought it would be cute to have a human in there wearing ref stripes). But after a few years, they realized that they needed somebody to interact with the dogs, and be more of a spokeperson for the dogs — because, obviously, they don't have a voice — so they put out this casting call, and I got in line. Still, I had to prove myself, because they could have been thinking, I don't know, how much does he really love dogs? I immersed myself in dog refereeing: I went to dog parks throughout New York City, where I live, and just asked random dog owners if I could play with their dogs… and blow a whistle in their faces and throw a flag down. I got a lot of weird looks and a lot of rejections, but one or two people said yes. (Plus, I forced my sister to let me play with her dogs.) And I videotaped it, cut it together with some footage of my messy house with two young kids, goldfish and hamsters, and said, "I have plenty of experience officiating small animals, please take a look." They bought it, and here I am, seven years later. The show has really has grown over the years: Over the course of our day of airing, we regularly have over 10 millions viewer, and we're the second most trending thing on social media after the big game on Super Bowl Sunday. But the best part, really, is the ability to facilitate adoptions, which we’ve continued to expand this year. Now, I always do see old players, because of Instagram: The Puppy Bowl pedigree is a big calling card for a lot of these pups, and many of them have become stars in their own , especially if they were voted MVP, (Most Valuable Pup). But two years ago, for Puppy Bowl XII, we started doing a Hall of Fame with NFL Hall of Famer Bruce Smith, and all these old players from past years — like Rudy, who is our little pup that could – came up and were able to get another little bit of affection and love. That led to us thinking about older dogs. Now, all of our pups get adopted, especially the MVPs, but there are plenty of older dogs out there in rescues and shelters that are not adopted, and we thought that we could also shed a light on them. That eventually led all of us to the idea of the Dog Bowl, which will air for the first time the day before the Puppy Bowl this year. And if you combine the dogs from Dog Bowl, which is, and the 90 from the Puppy Bowl, we’ll have 140 adoptable dogs participating this weekend. I guarantee you that they'll all find homes by the time we air. It's a record for us; this is a really big year. But beyond that, the shelters that we partner with — and we've partnered this year with 48 across the country, and even one in Mexico — all report an uptick in adoptions for months after the Puppy Bowl. Often, yes, people go searching for those pups that they've fallen in love with on the show. Say you fall in love with J- Paw ( Jennifer Paw-rence,) and you go online to Badass Brooklyn Animal Rescue this Sunday because you want to adopt her, but she's already gone. Maybe, though, she's part of a litter and she's got siblings, or maybe there are dogs very similar to J-Paw at this particular shelter, and you fall in love again. The idea is not to simply get you connected with that one Puppy Bowl star — which is possible, but the chances are slim; the goal is to get you connected with a shelter in your community, and to facilitate an ongoing relationship. Eventually, if you keep that partnership alive and communicate with them about your needs, they will find the perfect dog for you. The fun of Puppy Bowl is getting all of these untrained, un-housebroken dogs in one spot, at the same time, and seeing what happens. It's chaos, but in a controlled way — snouts and tails, the napping, and the pancaking (which is when the dogs flatten each other), the hiding in the tunnels, the bathing in the water bowls and all of the accidents that come with it. We want it to be puppies being puppies, because we don't want to send a false impression to our audience that if you adopt a puppy it's going to be just like cuddles and roses all day. You're going to get an active animal in your house that you're going to have to take care of, and we want to show all of it. I like that about us, we're really putting it all out there for our audience, because we love dogs in all their chaos, and we want people to love them, too. 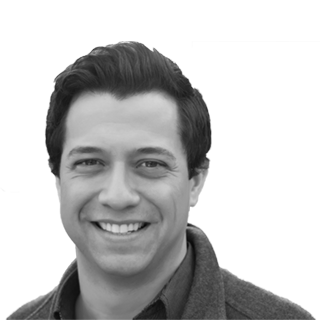 Dan Schachner is an actor, voice-over artist and television host. He has served as the referee for Animal Planet's annual Puppy Bowl since 2012.